A new study published in July by Fort Davis biologist Kelly Bryan confirms that West Texas has the second-most diverse hummingbird population in the country, with 17 species identified in the region. The study, which Bryan has been collecting data for over the last ten years, identified the 17th species, the Buff Bellied Hummingbird. To collect the data need for the study, Bryan used a process called bird-banding, which involves catching individual hummingbirds and putting a .56 millimeter band on each bird’s leg. Each band has a unique number on it, and that number corresponds to a set of data specific to the bird’s species, age, and gender, and over the ten-year period Bryan banded over 18,000 hummingbirds. Based on Bryan’s data, the most common hummingbird to the area was the Black-Chinned Hummingbird with 7,199 banded, followed by the Rufous Hummingbird with 4,426, and the Broad-Tailed Hummingbird with 3,705 banded. 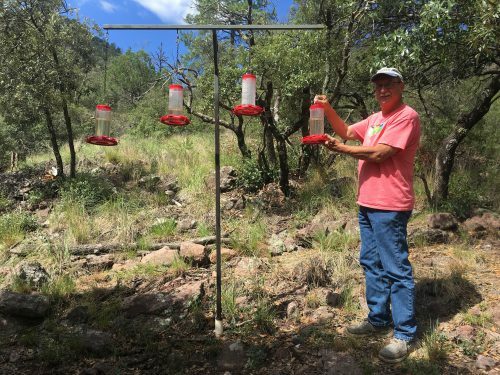 This entry was posted in KRTS News and tagged Birds, Davis Mountains, Fort Davis, Hummingbirds. Bookmark the permalink.